Snow lies on the grass and the fields, freezes, shoved into huge piles graying with macadam and gravel, trash and mud. Winter abides but only just; even with the cold snap, I sense a kind of anticipatory nudge toward warmer hours and longer days. It gets me thinking about my perspective on seasons. The lunisolar calendar I mentioned in a previous post seems more appropriate to my experience than the Gregorian, and perhaps the reason is that NongLi originated as, and essentially remains, an agricultural calendar. against the inner thigh; and justice. Which perspective I’m illustrating in the poem above. The poem’s speaker aggregates everything into the personal construct of ownership: what is owned is what matters. Implications of greed, of personal views on justice, of personal definitions (how points of view get tainted as they run through human beings’ individual filters)–those abstract ideas the poem tries to convey through the concrete images of animals, sounds, foodstuffs, geology. Every time there is a crime, journalists seek the story. Police talk about putting together the story of the perpetrator. The person’s story assists in determining motive. Motive can assist in solving a crime or prosecuting the perpetrator. Stories require conflict. What is a drama or novel without plot? There is a whole world of plot for narratives, but they tend to need conflict somewhere. The narrative vein in poetry follows the same story source, although in poetry much can be compressed. There are nonetheless implications of conflict, sometimes powerfully so. I have posted before about human beings as “The story-telling animal.” Brian Boyd and Daniel Dennett and others note the ways in which stories help us to understand ourselves and others. I begin to think that storytelling gives us not merely a method for examining cognition, but that perhaps telling stories=human sentience. That perhaps we would not be sentient if we were not aware of stories, able to invent them, or try to recall our own memories in a storytelling fashion. We could be human beings without them, but we could not be sentient. This is just a story I’m creating for myself in this moment. This is my own story about sentience, consciousness, and compassion through understanding of narrative persons, personas, and perspectives. Do we need better stories? Last year, I had my first encounter with a grass-carrying wasp. 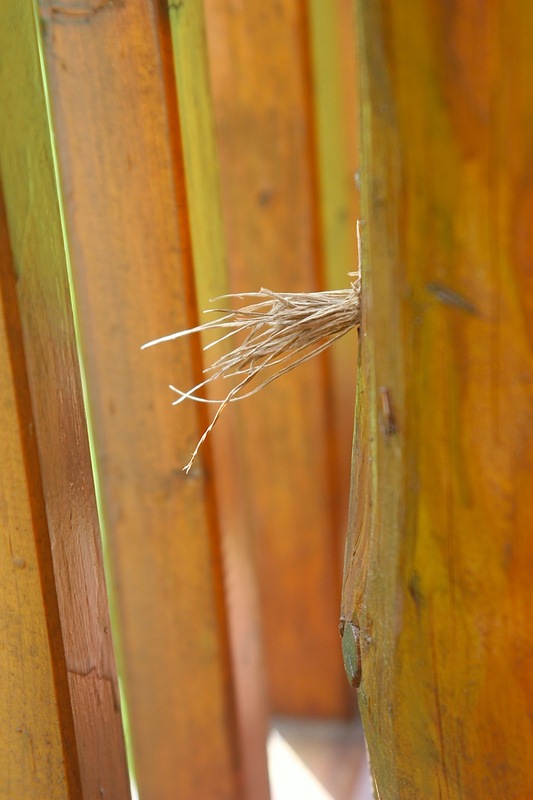 Today, I noticed some waxy, crumbly, yellowish bits around the post in which last year’s wasp had built its nest. Then I saw an adult grass-carrying wasp hovering to and fro with a stem of grass grasped in its legs, which led me to this year’s nest–in a different hole in our post-and-beam porch. Who knew the wood had so many little holes in it? The wasps sure found them! Today’s wasp has built in a much harder place to photograph, a vertical spot, behind a post. So last year’s photo will have to suffice. I am not quick at writing poems in response to events, personal or public; generally I need time to consider deeply, to process. I am glad to participate in an upcoming event, however, taking place in Bethlehem PA as a public response to the Orlando Pulse shooting. LGBT citizens of the region, and families, friends and supporters of compassion and awareness, are gathering for a memorial and celebration of support for everyday Americans, which includes–we must recognize, and it would be wise and sane to accept–people who are LGBT/gender fluid & who are just human beings notwithstanding, as are we all. For those in the Lehigh Valley area of Pennsylvania, the poetry reading is at Sun Inn’s courtyard on Friday July 1. I may not have a poem of my own to read, but I have been reading through my library and have already located several poems by other writers that will serve well as responses to tragedy, personal or national, or which speak to the human-ness of all of us. I am doing a little nesting of my own this week, retreating into a metaphorical burrow for a couple of days, I hope. And with any luck, I will emerge with some new drafts of poems.